It's unbelievable how much the view from the top of the old Fortress has changed within one century. 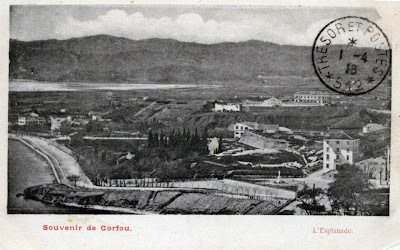 In this late nineteenth century card postal, the area around the tennis court and Alexandras avenue had not been built up yet. In where now Corfu Palace hotel, the former "Rolina" casino building and the archeological museum stand, there was a british cemetery while the San Salvatore hill prison, built by the british on the site where a venetian fort stood, had been already been built. Note that the hill did not had any trees! 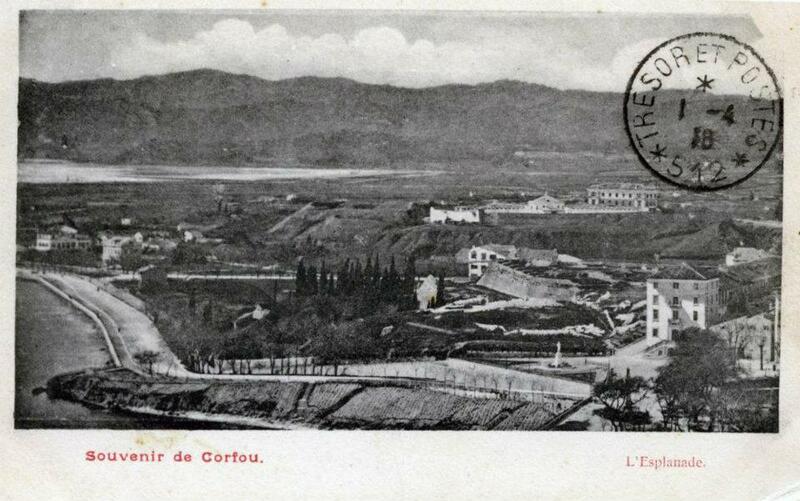 Next to the prison, the 3th and the 4th high school building housed the first hospital in Corfu. On the far left side of the photo can be seen Garitsa's first houses and behind them in the background Chalikiopoulos inlet untouched, long before Corfu's airport been built. On the opposite side, the Ionian Academy building and Kapodistrias statue proudly dominate the site where Porta Remounda, the southernmost city gate once stood before being erased by the british in the 1830s to give way for the coastal avenue to be constructed.